With just a little effort, home gardeners can successfully grow blueberries in containers. The blueberry is a wonderful fruit rich in vitamin C, dietary fiber, and vitamin E. Due to its popularity, there is a growing interest among gardeners to plant blueberries in backyard gardens. One of the most critical factors for successful blueberry production is providing an ideal soil pH in the range of 4.5 to 5.0. This is a challenge in many parts of Wisconsin where soils are typically too alkaline (i.e., the soil pH is too high – above 7.0) for blueberries. Highly alkaline soils that are clay or high in organic matter can be amended by adding large amounts of sulfur to lower the pH, but will require repeated amendments over time to maintain an ideal pH. Therefore, attempting to lower soil pH may not be a viable option for backyard gardeners who have an elevated soil pH. An alternate option for producing blueberries is to grow them in a container filled with an acidic soilless growing medium. How do I prepare the growing medium? To prepare an acidic soilless growing medium, use a mix of one part sphagnum peat moss and one part shredded pine bark. Another growing medium that works well is a mix of two parts coir (shredded coconut husks used in the greenhouse industry), two parts sphagnum peat moss and one part perlite. Mix all ingredients well. 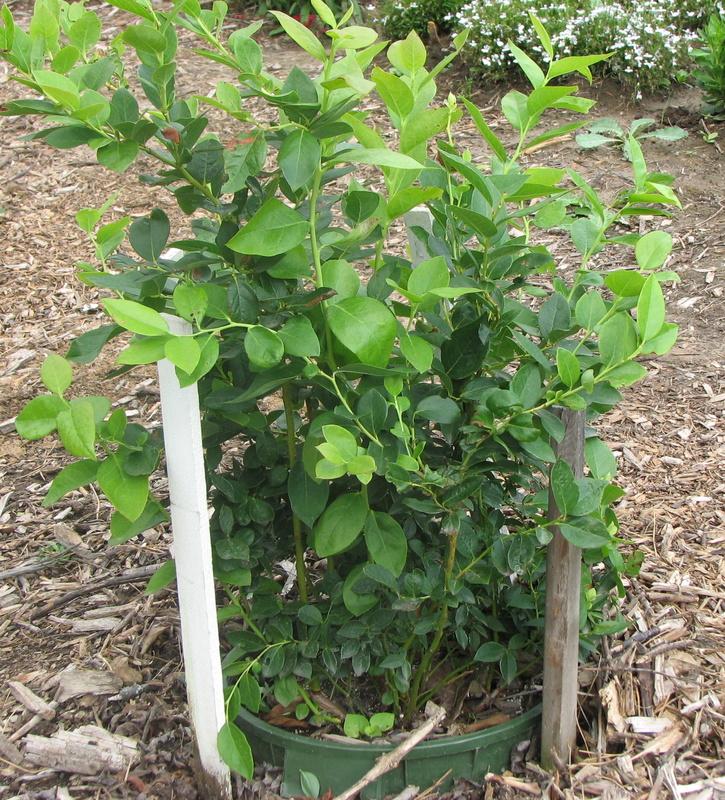 Fill a five-gallon container with whichever mix you decide to use, and plant a single blueberry plant in the container. As the plant matures, repot it in a larger container (e.g., a 16 or 20 inch pot) or in a barrel, once again filled with the acidic soilless growing medium of your choice. What cultivar of blueberry should I use? When selecting blueberry plants, choose half-high bush cultivars as they are hardier in Wisconsin, and are relatively short in stature. Some popular half-high cultivars recommended for Wisconsin (i.e., hardy in zones 3 though 5) are ‘Northblue’, ‘Northsky’, ‘St. Cloud’, ‘Polaris’, ‘Chippewa’, ‘Northland’, and ‘North Country’. You can also select low bush blueberry cultivars such as ‘Top Hat’ (hardy to zone 5) for container production. Low bush cultivars have a dwarf (i.e., maximum 12 inch height) and spreading growth habit and typically produce smaller fruit. Most blueberry cultivars are self-fruitful and do not require another cultivar for cross pollination (‘St. Cloud’ and ‘Polaris’ are exceptions). In general however, growing more than one blueberry cultivar will improve pollination and enhance yield and berry size. 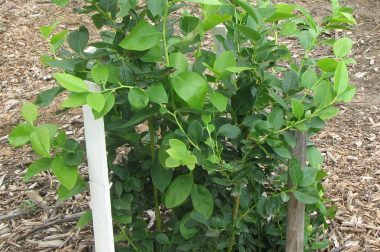 How much water will my blueberry plants need? When growing containerized blueberries, closely monitor growing medium moisture levels. Blueberries do not like to have ‘wet feet’, but insufficient moisture can also be a problem. Therefore, try to maintain a moist, but not wet/soggy, growing medium. Frequent, light watering is ideal, with an occasional ‘drench’ to eliminate soil salts. Mulch the soil surface with two inches of pine bark or chipped hardwood bark to conserve moisture. Avoid using black containers for planting blueberries as such containers absorb heat leading to more rapid moisture loss. If using drip irrigation, place two emitters in each pot on either side of a plant. Another way to reduce heat stress and water loss is to bury containers in the ground. Buried containers can be left in ground for over-wintering. Water quality is as important for growing blueberries as the composition of the growing medium. Collected rainwater is ideal for watering, and typically is not as ‘hard’, nor has as high of a pH as well water. How do I overwinter my blueberry plants? Because containers do not provide adequate insulation from the cold, be sure to protect container-grown blueberries during the winter to prevent root damage. In mid- to late October, bury containers in the ground at a site where snow is likely to accumulate and where plants will be protected from cold winter winds. Mulch the soil surface with four to eight inches of straw in mid-November or cover the bushes with burlap. Prevent rabbit damage by placing chicken wire fencing or hardware cloth around the bushes. During early to mid-spring, remove containers from the ground and place them in full sun. Alternatively, containers can be left buried in the soil as long as the containers have proper drainage holes and the site where the containers are buried is well drained and exposed to full sun. How do I properly fertilize my blueberry plants? A combination of supplemental liquid and slow-release acid fertilizers is recommended. Avoid overapplying fertilizers, as blueberry roots are sensitive to fertilizer salt injury. Apply slow-release acid fertilizers (e.g., elemental sulfur) four weeks after planting in the first year and then top dress the growing medium surface lightly the following spring. Make sure you follow the recommended rates described on the fertilizer label.Slow-release fertilizers will typically need to be supplemented periodically (usually every two weeks) with more fast-acting acidic liquid fertilizers (e.g., Miracid) when the blueberry plants are actively growing during the spring through mid-summer. For more information on growing blueberries in containers: Contact your county Extension agent.